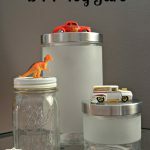 Over the past few years, you’ve seen Aubree on the blog pretty often, we’ve traveled to Walt Disney World, picked out some Back to School Outfits for Kindergarten, and had an all around fun time. 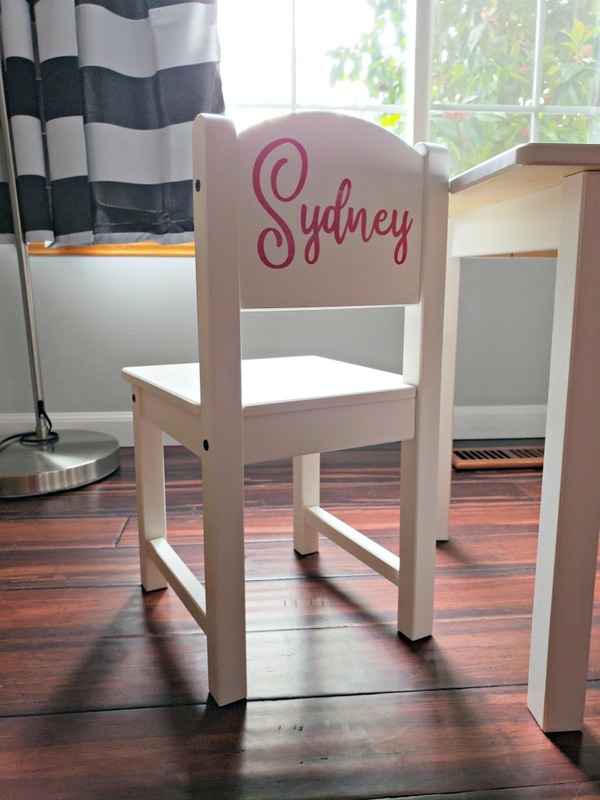 5 years ago I made her a personalized chair using the SUNDVIK line at IKEA for her first birthday. A few weeks ago, I had another 1st birthday to attend so I decided that another chair was in order. 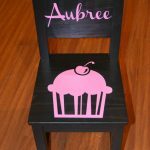 This time, I decided to do a table and chair set, and it turned out absolutely adorable. I thought for a while on what theme I wanted for Sydney’s chairs. I finally decided to do coordinating, but not necessarily matching chairs. 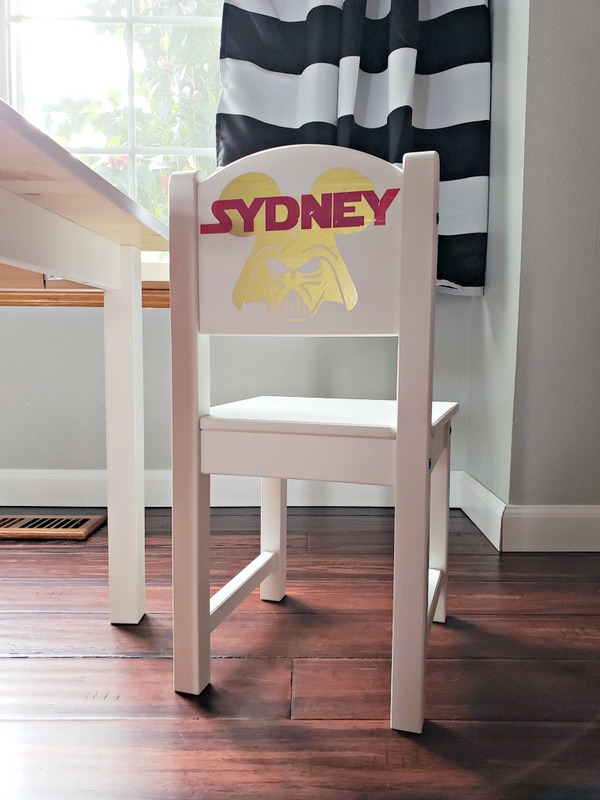 Syndey’s dad is a HUGE Star Wars fan, and one of her favorite toys is a stuffed Porg that makes noise, so I decided that one of the chairs needed to be Star Wars themed. 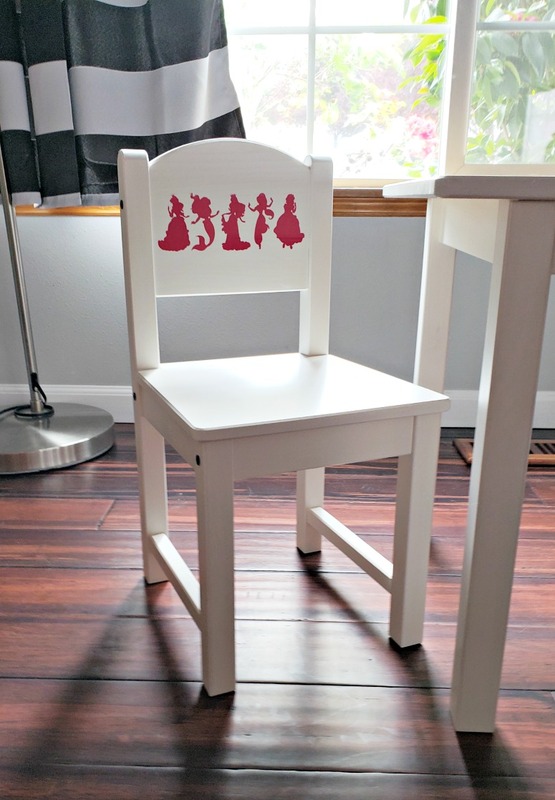 For the second chair, I went girlier with some classic Princess outlines. Picking out fonts can be one of the hardest part of any project. I wanted something that would really fill the space on the back of the chair. I love using the website wordmark.it to see how her name would look in all of the fonts that I have installed on my computer. To verify how the design filled the space, I created a rectangle of the chair back space in Silhouette Studio and then sized the decals accordingly. 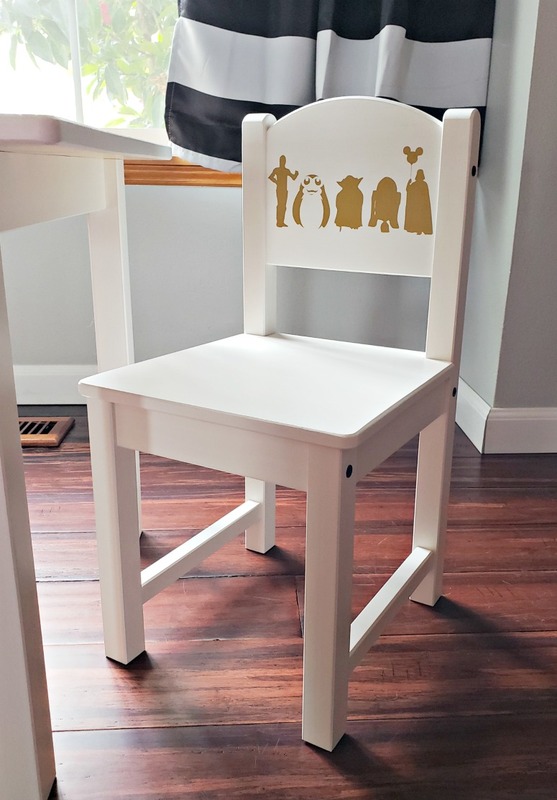 For the Star Wars themed chair, I went with some of the classic silhouettes, making sure to include a Porg, and my Darth Vader ties into the other chair with the Mickey balloon that he is holding. You might also recognize this design from a t-shirt that I made last year. Since the “Star Jedi” font didn’t really fill the back side of the chair, I added a Darth Mickey decal as well for a nice balanced design. 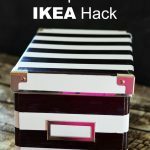 I kept two color themes for the chairs as well – hot pink and metallic gold. I wanted the simplicity of the character outlines, and these colors were a fun feminine touch. I absolutely love how this table and chair set turned out. Sydney was quite proud of herself sitting on the chair while she opened her other gifts throughout the party too. The SUNDVIK table and chairs are quite sturdy and will definitely last her for years to come. 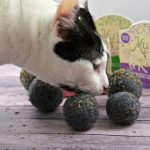 Plus, they are a great size to grow with her as she gets older. 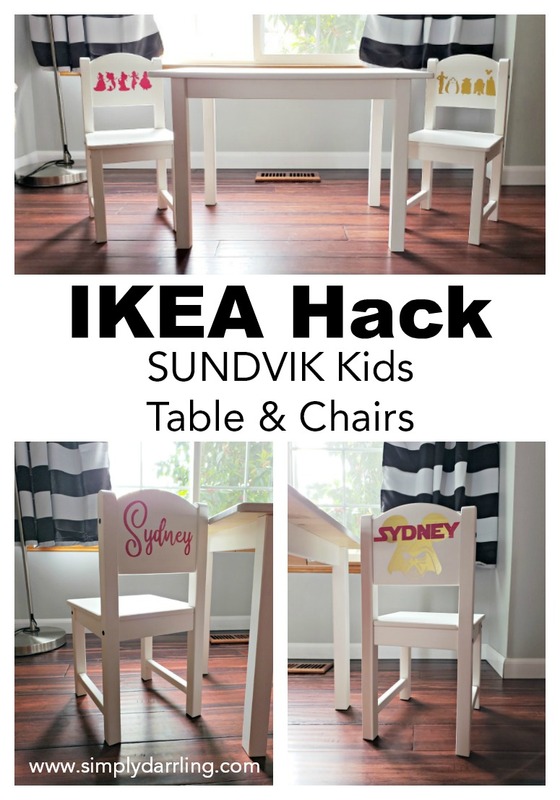 The SUNDVIK table and chairs from IKEA make for the perfect personalized gift because they are a great blank canvas. 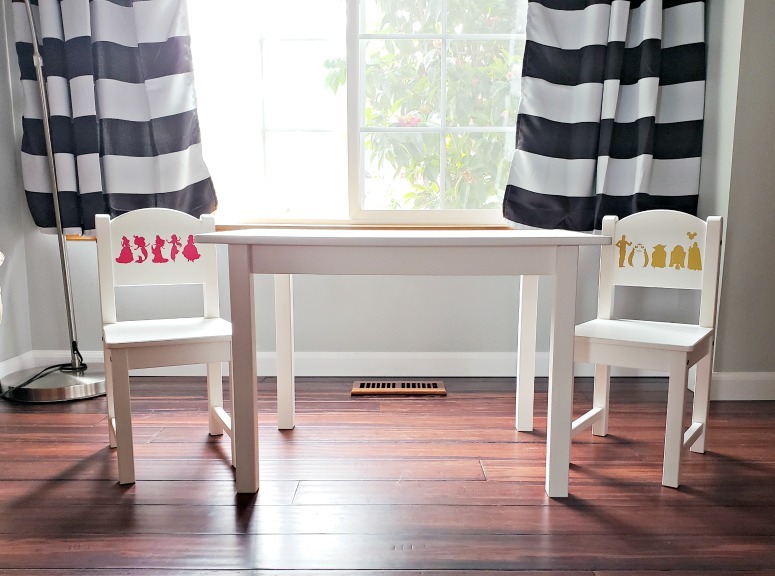 The table could easily be transformed to a fun game table, roadway for play cars, or painted to match your home decor. If you’re looking for a darker canvas, they also come in Black-Brown wood in addition to the White. What theme would you make for your home? Man, where was the Silhouette Studio when I was a kid? I would have been in heaven with that princess chair!